The spring semester is finally upon us! And although it doesn’t feel (or look) much like spring just yet, keep in mind that warmer weather is getting closer each day. 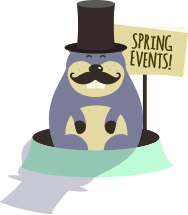 Regardless of what our favorite groundhog , good ol’ Punxsutawney Phil, tells us today, we have many good things to look forward to in the coming weeks: wearing shorts, having more hours of precious sunlight and, my personal favorite, enjoying free Rita’s water ice on the first official day of spring. Here at Falvey we are looking forward to all of the things to come and are happy to offer another semester full of events and activities to keep your mind off of this blustery climate! The Library has a great line-up of workshops, panels, talks, open houses, meetings and other events almost every day of the week! This semester’s highlights include a Black History Month lecture by Saladin Ambar, PhD; a talk about academic libraries in the Digital Age by Phi Beta Kappa Scholar William Y. Arms, PhD; Literary Festival talk featuring author Bruce Smith; several Scholarship@Villanova talks featuring Villanova faculty members such as Helene Moriarty, PhD, RN (Nursing), Megan Quigley, PhD (English) and Lisa Sewell, PhD (English); an Open Mic Poetry Reading ;and even a celebration in honor of Earth Day featuring a panel about climate change. Our culminating event of the semester will be our 2015 Falvey Scholars Awards presentation and reception in which the Library recognizes undergraduates from all five colleges at the University for their outstanding research projects. 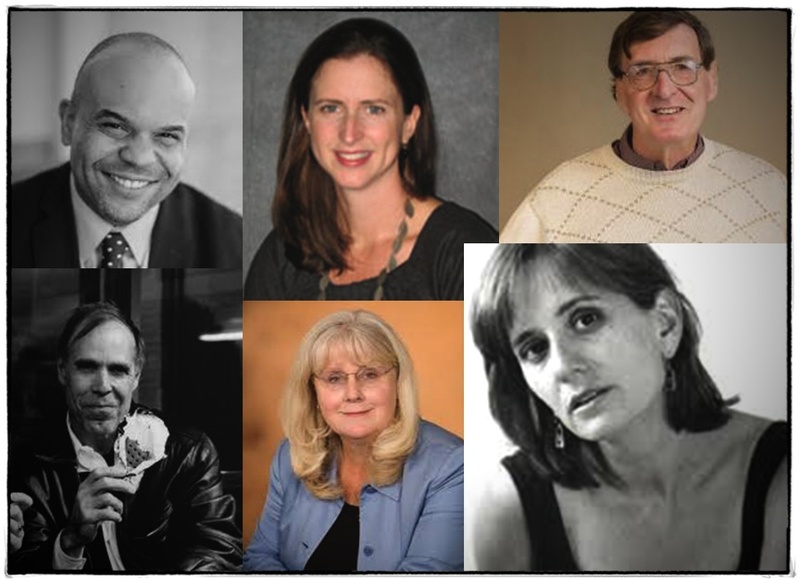 Spring Event Speakers: Clockwise from upper left: Ambar, Quigley, Arms, Sewell, Moriarty and Smith. As usual, some of our regularly scheduled events will include VSB peer-tutoring office hours in the Learning Commons almost every Tuesday, Wednesday and Thursday night at 6:00 p.m. and the Villanova Electronic Enthusiasts Club (VEEC) meetings on many Friday afternoons in our first floor lounge throughout the semester. Be sure to stop by the Library to participate in these events as they are free and open to all! In addition to events the Library plans, Falvey also serves as a host site for events organized by other departments and groups from all across campus. Villanova faculty, staff and representatives from official student groups are able to request a space for their event or meeting by filling out the Events Request Form or by directly contacting Regina Duffy, library events and Outreach program manager. Event locations include the Speakers’ Corner, Learning Commons rooms on the second floor ( 204, 205, 206, 207) and the first-floor lounge. And, if all of the exciting things going on in Falvey aren’t enough to snap you out of the winter blues, don’t worry; spring break will soon be in our midst! Hang in there! Article by Regina Duffy, writer for the Communication & Service Promotion team and Library Events and Outreach Program Manager.